This article is about the 1997 science fiction film. For the 1934 Three Stooges film, see Men in Black (1934 film). After a government agency makes first contact with aliens in 1961, alien refugees live in secret on Earth by disguising themselves as humans in the New York metropolitan area. 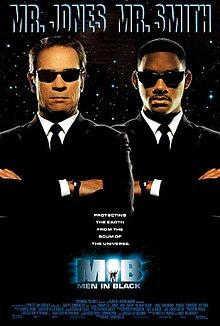 Men in Black is a secret agency that polices these aliens, protects Earth from intergalactic threats and uses memory-erasing neuralyzers to keep alien activity a secret. Men in Black agents have their former identities erased and retired agents are neuralyzed and given new identities. After an operation to arrest an alien criminal near the Mexican border by agents K and D, D decides that he is too old for his job to which K neuralyzes him and begins looking for a new partner. New York Police Department officer James Darrell Edwards III pursues a supernaturally fast and agile suspect into the Solomon R. Guggenheim Museum. Impressed, Men in Black agent K interviews James about his encounter, then neuralyzes him and leaves him a business card with an address. Edwards goes to the address and undergoes a series of tests, for which he finds unusual solutions. While the other candidates are neuralyzed, K offers Edwards a position with the Men in Black. Edwards accepts and his identity is erased, becoming Agent J, the newest Men in Black recruit. In upstate New York, an alien illegally crash-lands on Earth and kills a farmer named Edgar to use his skin as a disguise. Tasked with finding a device called "The Galaxy", the Edgar alien goes into a New York restaurant and finds two aliens (disguised as humans) who are supposed to have it in their possession. He kills them and takes a container from them, but is angered to find only diamonds inside. After learning about the incident in a tabloid magazine, K investigates the crash landing and concludes that Edgar's skin was taken by a "bug", a species of aggressive cockroach-like aliens. He and J head to a morgue to examine the bodies the bug killed. Inside one body (which turns out to be a piloted robot) they discover a dying Arquillian alien, who says that "to prevent war, the galaxy is on Orion's belt". The alien, who used the name Rosenberg, was a member of the Arquillian royal family; K fears his death may spark war. Men in Black informant Frank the Pug, an alien disguised as a pug, explains that the missing galaxy is a massive energy source housed in a small jewel. J deduces that the galaxy is hanging on the collar of Rosenberg's cat Orion, which refuses to leave the body at the morgue. J and K arrive just as the bug takes the galaxy and kidnaps the coroner, Laurel Weaver. Meanwhile, an Arquillian battleship fires a warning shot in the Arctic and delivers an ultimatum to Men in Black: return the galaxy within a "galactic standard week", or an hour of Earth time, or they will destroy Earth. The bug arrives at the observation towers of the 1964-1965 New York World's Fair New York State Pavilion at Flushing Meadows, which disguise two real flying saucers. Once there, Laurel escapes the bug's clutches when it accidentally drops her. It activates one of the saucers and tries to leave Earth, but K and J shoot it down and the ship crashes into the Unisphere. The bug sheds Edgar's skin and swallows J and K's guns. K provokes it until he too is swallowed. The bug tries to escape on the other ship, but J slows it down by taunting it and crushing cockroaches, angering it. K blows the bug apart from the inside, having found his gun inside its stomach. J and K recover the galaxy and relax, thinking the whole ordeal over, only for the still living upper half of the bug to pounce on them from behind but Laurel kills it with J's gun. At Men in Black headquarters, K tells J that he has not been training him as a partner but a replacement. K bids J farewell before J neuralyzes him at his request; K returns to his civilian life and Laurel becomes J's new partner, L.
Tommy Lee Jones as Kevin Brown/Agent K: J's grizzled and humorless mentor. Clint Eastwood turned down the part, while Jones only accepted the role after Steven Spielberg promised the script would improve, based on his respect for Spielberg's track record. He had been disappointed with the first draft, which he reportedly said "stank"; he felt it did not capture the tone of the comic. Linda Fiorentino as Dr. Laurel Weaver/Agent L: A deputy medical examiner who has had a few run-ins with the MIB in the past. D'Onofrio also portrays the farmer that gets killed by the Bug. Siobhan Fallon Hogan as Beatrice: The wife of the farmer Edgar, whom the 'Bug' killed and used his skin as a disguise. Mike Nussbaum as Gentle Rosenberg: An Arquillian jeweler who is the guardian of "the Galaxy". Tim Blaney as Frank: A smart-talking pug-like alien. The film is based on Lowell Cunningham and Sandy Carruthers's comic book The Men in Black. Producers Walter F. Parkes and Laurie MacDonald optioned the rights to The Men in Black in 1992, and hired Ed Solomon to write a very faithful script. Parkes and MacDonald wanted Barry Sonnenfeld as director because he had helmed the darkly humorous The Addams Family and its sequel Addams Family Values. Sonnenfeld was attached to Get Shorty (1995), so they approached Les Mayfield to direct, as they had heard about the positive reception to his remake of Miracle on 34th Street. They actually saw the film later and decided he was inappropriate. Men in Black was delayed so as to allow Sonnenfeld to make it his next project after Get Shorty. Much of the initial script drafts were set underground, with locations ranging from Kansas to Washington, D.C. and Nevada. Sonnenfeld decided to change the location to New York City, because the director felt New Yorkers would be tolerant of aliens who behaved oddly while disguised. He also felt much of the city's structures resembled flying saucers and rocket ships. One of the locations Sonnenfeld thought perfect for the movie was a giant ventilation structure for the Brooklyn–Battery Tunnel, which became the outside of the MIB headquarters. Filming began in March 1996. Many last-minute changes ensued during production. First, James Edwards chasing a disguised alien was to occur at the Lincoln Center. But once the New York Philharmonic decided to charge the filmmakers for using their buildings, Sonnenfeld and Welch went for the Solomon R. Guggenheim Museum. Then, five months into the shoot, Sonnenfeld decided that the original ending, with a humorous existential debate between Agent J and the Bug, was unexciting and lacking the action that the rest of the film had. Five potential replacements were discussed. One of these had Laurel Weaver being neuralyzed and K remaining an agent. Eventually it boiled down to the Bug eating K and fighting J, replacing the animatronic Bug Rick Baker's crew had developed with a computer-generated Bug with an appearance closer to a cockroach. The whole action sequence cost an extra $4.5 million to the filmmakers. Further changes were made during post-production to simplify the plotline involving the possession of the tiny galaxy. The Arquillians would hand over the galaxy to the Baltians, ending a long war. The Bugs need to feed on the casualties and steal the galaxy in order to continue the war. Through changing of subtitles, the images on M.I.B. 's main computer and Frank the Pug's dialogue, the Baltians were eliminated from the plot. Earth goes from being potentially destroyed in the crossfire between the two races into being possibly destroyed by the Arquillians themselves to prevent the Bugs from getting the galaxy. These changes to the plot were carried out when only two weeks remained in the film's post-production, but the film's novelization still contains the Baltians. Production designer Bo Welch designed the M.I.B. headquarters with a 1960s tone in mind, because that was when their organization is formed. He cited influences from Finnish architect Eero Saarinen, who designed a terminal at John F. Kennedy International Airport. As the arrival point of aliens on Earth, Welch felt M.I.B. HQ had to resemble an airport. Rick Baker was approached to provide the prostethic and animatronic aliens, many of whom would have more otherworldly designs instead of looking humanoid. For example, the reveal of Gentle Rosenberg's Arquillian nature went from a man with a light under his neck's skin to a small alien hidden inside a human head. Baker would describe Men in Black as the most complex production in his career, "requiring more sketches than all my previous movies together". Baker had to have approval from both Sonnenfeld and Spielberg: "It was like, 'Steven likes the head on this one and Barry really likes the body on this one, so why don't you do a mix and match?' And I'd say, because it wouldn't make any sense." Sonnenfeld also changed a lot of the film's aesthetic during pre-production: "I started out saying aliens shouldn't be what humans perceive them to be. Why do they need eyes? So Rick did these great designs, and I'd say, 'That's great — but how do we know where he's looking?' I ended up where everyone else did, only I took three months." The maquettes built by Baker's team would later be digitized by Industrial Light and Magic, who was responsible for the visual effects and computer-generated imagery, for more mobile digital versions of the aliens. Danny Elfman composed the film's score, making use of his usual combination of orchestra and electronics. Will Smith recorded a song based on the film's plot, also called "Men in Black". Elvis Presley's cover of "Promised Land" is featured in the scene where the MIB's car runs on the ceiling of Queens–Midtown Tunnel. Two different soundtracks were released in the U.S.: a score soundtrack and an album, featuring various songs. In the U.K., only the album was released. Galoob released various action figures of the film's characters and aliens. An official comic adaptation was released by Marvel Comics. The official Men in Black game is a third-person shooter developed by Gigawatt Studios and published by Gremlin Interactive and released to lackluster reviews in October '97 for the PC and the following year for the PlayStation. Also a very rare promotional PlayStation video game system was released in 1997 with the Men in Black logo on the CD lid. Men in Black: The Animated Series was created by Sony Pictures Television, and also inspired several games. Men in Black was the inspiration behind the Men in Black: Alien Attack ride at Universal Studios Orlando, in which Will Smith and Rip Torn reprised their roles. A Men in Black role-playing game was also released in 1997 by West End Games. Men in Black won the Academy Award for Best Makeup, and was also nominated for Best Original Score and Best Art Direction. It was also nominated for the Golden Globe Award for Best Motion Picture - Musical or Comedy. On review aggregator website Rotten Tomatoes, the film holds an approval rating of 92% based on 85 reviews, and an average score of 7.4/10. The site's critical consensus reads, "Thanks to a smart script, spectacular set pieces, and charismatic performances from its leads, Men in Black is an entirely satisfying summer blockbuster hit." On Metacritic, the film has a weighted average score of 71 out of 100, based on 22 critics, indicating "generally favorable reviews". Audiences polled by CinemaScore gave the film an average grade of "B+" on an A+ to F scale. On Empire magazine's list of the 500 Greatest Movies of All Time, "Men in Black" placed 409th. Following the film's release, Ray-Ban stated sales of their Predator 2 sunglasses (worn by the organization to deflect neuralyzers) tripled to $5 million. Men In Black was released on Blu-Ray & DVD on June 17, 2008. The entire Men In Black trilogy was released on 4K UHD Blu-Ray on December 5 2017. ^ a b "Men in Black (1998)". Box Office Mojo. Retrieved 2007-12-14. ^ a b c d e f g h i David Hughes (2003). Comic Book Movies. London: Virgin Books. pp. 123–129. ISBN 0-7535-0767-6. ^ "Summer Movie Preview". Entertainment Weekly. 1997-05-16. Retrieved 2007-09-17. ^ Donnelly, Billy (May 25, 2012). "Things Get A Bit Heated Between The Infamous Billy The Kidd And Director Barry Sonnenfeld When They Talk MEN IN BLACK 3". Ain't It Cool News. ^ Steve Daly (1997-07-18). "Men in Black: How'd they do that?". Entertainment Weekly. Retrieved 2007-09-17. ^ Barry Sonnenfeld, Tommy Lee Jones. Visual Commentary. Men in Black. ^ "Men in Black (1997) — Awards and Nominations". Yahoo!. Retrieved 2007-09-17. ^ "Men in Black Reviews". Metacritic. Retrieved 2017-03-10. ^ "Men in Black". CinemaScore. Retrieved May 23, 2018. ^ "Empire's 500 Greatest Movies of All Time". Empire Magazine. Retrieved 2012-05-28. ^ Jane Tallim (2002). "And Now a Word From Our Sponsor... Spend Another Day". Media Awareness Network. Archived from the original on 2008-08-19. Retrieved 2008-10-14. ^ "Men in Black DVD Release Date". DVDs Release Dates. Retrieved 2018-05-19.